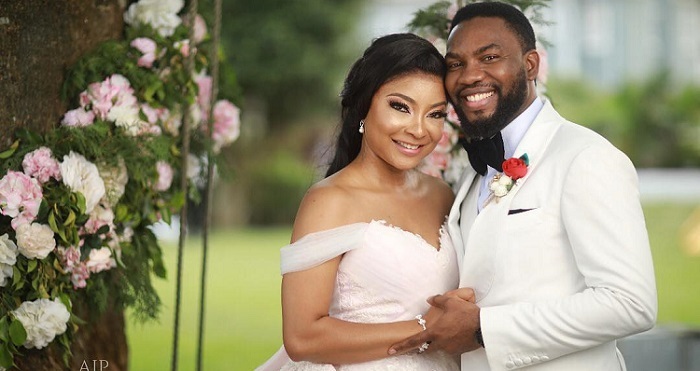 Congratulations are in order — Linda Ejiofor is officially a married woman. The actress had her traditional and court wedding a few days ago, but yesterday she officially said ‘I do’ to longtime boyfriend Ibrahim Sule in front of family and friends at a romantic outdoor gathering. Ejiofor made a stunning bride in a Mai Atfo’s baby pink ball gown that flatters her figure thanks to the sensual off-the-shoulder silhouette that featured lace appliques and a massive bow at the back. She wore her hair in a cascading style (topped with a veil, of course) and accessorized with silver drop earrings and finished with subtle pink lips. The husband also made a dapper groom in a white and black tuxedo from the same designer. As for the bridesmaids, Linda seemingly made her big day very bright as her maids of honor were all outfitted in beautiful yellow dresses, except for the chief bridesmaid Adesuwa Etomi, who looked incredible in a white dress. She also seized the opportunity to serenade the couple with an emotional song. The actress announced the exciting union just a few days ago after she posted a photo with the hoodie-covered husband on Instagram alongside the caption: #APPROVED☺️❤️. And fans couldn’t wait for it after it was discovered the two co-starred in Tinsel tv series.